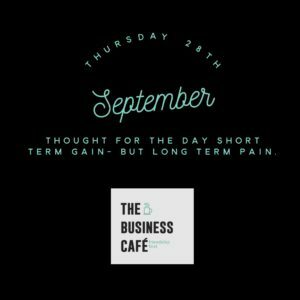 Todays thought is about ‘the pain of committing to something for a short terms solution and then having the pain in the longer terms to deal with. 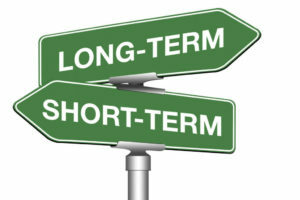 I have made some decisions in the past that I have really regretted, and when I start regretting them, I have realised that I was seeking immediate solutions in the short term, that led to long-term regret. This may resonate with you…. the employee you recruited to fill a fast need, the supplier, the client you knew you would find tough to manage, the investor; endless poor decision-making caused by what? Knowing what causes this, having awareness of your reasons and developing the skills to make decisions calmly and be in control is something I think we learn to develop. I like the term, ‘abundance and scarcity’, two emotions that can control our emotions, decisions and terrifyingly our image. How often do you meet someone at a networking event that can’t take the time to ask you a question, be interested in you, have a friendly conversation, oh now, they thrust their product and business card in your face and leave you stunned at the lack of their control. This does not help their image nor their pocket. I have sat in many talks from Motivational Speakers who tell us ‘always negotiate from abundance’. Of course, that is so true, if you don’t need the ‘thing’ now, then you will remain in control. Calmly assessing the negotiation. I laugh as I type this, how many times have I fallen in love with a jacket (that is my thing) and had to go home and see if it still nags at me, then I know if I really want it. Spontaneous decisions are dangerous.